The Family and Our Glamorous Time are down to their final weeks. The Family reached yet another series high with CSM52 ratings of 1.451% and finally made it to the top 10 online dramas. Our Glamorous Time is still in second and third on TV though numbers have stayed in the same range. The City of the Family and The King of Blaze are Hunan TV's new evening lineup that air back to back. Both had weak premieres that only drew in 0.3%. 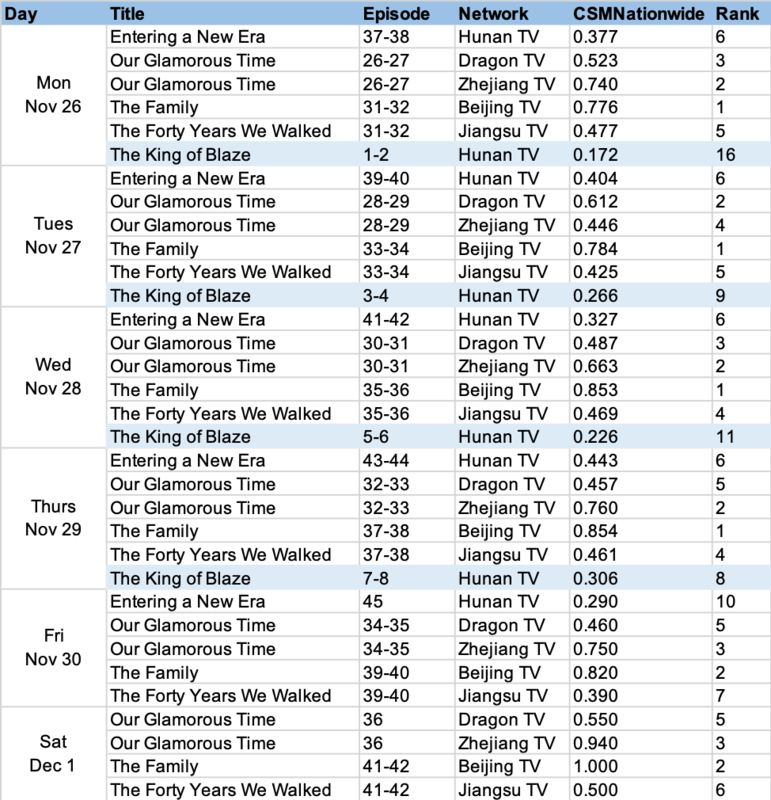 The King of Blaze ratings gradually increased to 0.6% in subsequent days and the show has earned 7th place online. Meanwhile, we are seeing changes to the top 3 online dramas led by Our Glamorous Time. Hi, I'm Saori climbs to third after bumping The Eternal Love Season 2 down by one place. Youth idol dramas seem to be cropping up more often and two of those - The Demon Master and When We Were Young also made the top 10. The weekly celeb list seems quite reflective of real-life happenings. Following his new drama, Neo Hou ranks in third just after Zhao Liying and Jin Han. Hu Ge and Jiang Jinfu are in 7th and 8th. It's still a tight race between The Family and Our Glamorous Time nationwide with each reaching a high of 1% and 0.94% respectively. *The above are mostly primetime shows that air at 19:30 while those highlighted in blue air at 22:00. **Rankings are overall rankings across the shows airing on the same night, regardless of air time. *** Reruns are not included. **** Dramas that air on CCTV (the state television broadcaster in China) are not included. ***** CSM52Cities and CSMNationwide are common tv metrics. ******Dec 2 Nationwide data not available. LOL Just saw complaints about how bad OGT is...but ZLY and JH are the very top 2 on the list...fans are just crazy with these ratings! ZLY broke off with her broker already, is this still his doing? Or, let's just stick with it's the fans doing it. Thanks for the ratings. 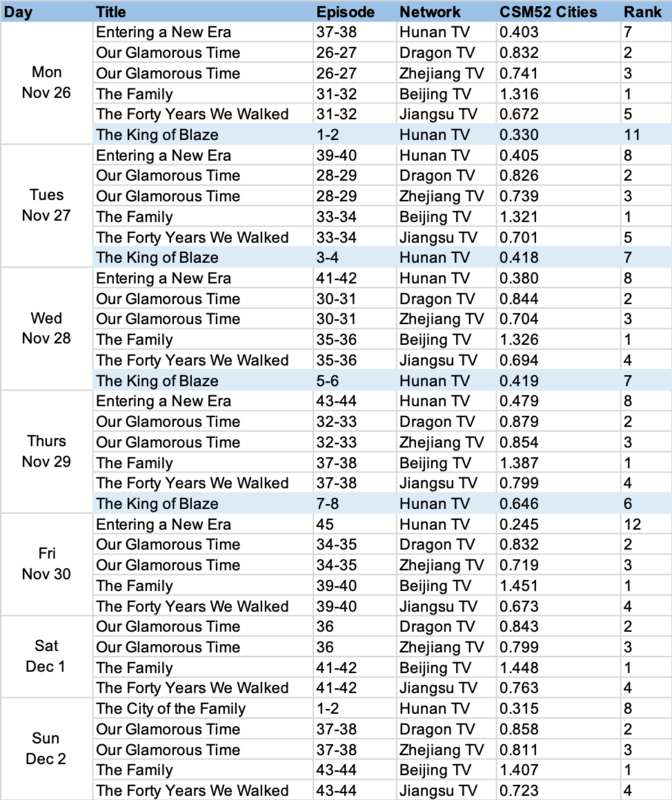 Considering the very negative reactions I've seen The king of Blaze's TV ratings don't look that bad. Good to see Ever Night doing so well. I might try out The Demon Master or When We Were Young. I feel like I am enjoying these smaller webdramas more than TV dramas now. I was interested in King of Blaze because I like Chen Bolin and Jing Tian but the trailers did nothing for me so unless I hear great things I'll keep giving it a miss. I heard so many good things about Ever Night so I started watching. The quality of the filming, editing, cinematography, fight scenes, sets is far superior to anything I've seen in a while in a drama. I'm just trying not to get too attached to the male lead as I know he was leaving. I like it a lot but not sure if I will come back for Season 2 because I don't have the patience for multi-season dramas. I just found some subs for When Were Young on YT so I'm going to start that. Maybe it's a good thing if you can't find any dramas? I feel like I spend way too much of my time watching dramas instead of doing something productive. You can work on real life stuff instead hahaha! lol That's an idea except the last drama i saw was The Guest and that was more than a month ago. Life is a little bland without dramas haha Ever Night really sounds like Tribes and Empires.. i will probably wait for the finale first, if there are no violent reactions about it, I look forward to giving it a go.